I’ve written a lot about running lately. So my mind has been on it even more than normal. It’s always funny to notice how a focus of attention seems to correlate with coming across unexpected ‘relevant’ information. Go on holiday to country X, suddenly one keeps running into people who’ve been there, it keeps popping up in the news, etc. All very much a reflection of how the mind works, rather than magical synchronicity. But that doesn’t make my joy at theses finds any less. My Dutch home town Nijmegen – because it’s also the home of some of the people behind the Dutch portal for trail and mountain running – has become the marketing tool for the Salomon city-trail project expanding into the Netherlands. Mind you, my country doesn’t have real cities. It doesn’t have real wilderness either. The whole place is basically one large garden city. Smaller cities like Nijmegen have non-urban trails relatively close by, wherever you live. So the ‘need’ for exploring city trails is a lot less than for those living in places that force you to travel longer distances to get anywhere close to unpaved trails. 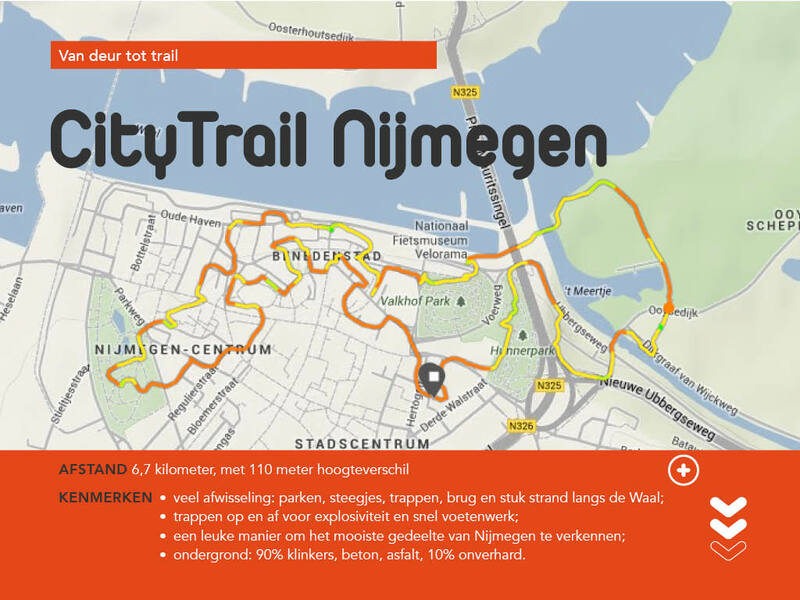 Have a look at this map of a Nijmegen city trail. Very well designed I must say, lots of interesting diversity and fun bits. Kudos to those who have put in the work for this! But look at the scale: 6.7k for a loop that does a lot of the city centre plus some country-side outside it. If my dreaming about developing a route covering a max of the off-road trail diversity in the Nijmegen area is ever going to bear fruit in waking reality, I’ll make use of the above for the inner city part. Unfortunately, the guys and girls behind the Dutch portal are all way too fast for me, and too gear-interested also. So I won’t even try to team up with them for that one. Let’s move from my home town to my current environment, Cairo. After making parkour such a central element of my thinking about running, it’s worth mentioning that of all kinds of running, parkour made it here even before ‘normal’ running started being widely promoted by the cairorunners ‘movement’ (all kinds of neighbourhoods now have started their local ‘chapters’). It’s the more acrobatics-focused freerunning variety that is being taught in Cairo. Cairorunners honoured these predecessors by giving them a podium during their post 2014 half marathon party. For both kinds of movement, what is most inspiring to see is that it’s not only boys. If this place, this region, needs anything, it is girl power. Great to see that these sports are picked up by girls, defying stereotypes, defying propriety conventions, becoming personally stronger and making a social statement in the act. Not only in Cairo, read this about girls in Tehran doing the same. I’ve recently expressed my pessimism about Egypt’s outlook. It’s a truism to state that if there is any hope, it has to be based on the young. I’m very unsure about their possibilities to stem the direction of the tide, at least in the short run. But the above are bright sparks amidst a generally darkening prospect. I very much hope that these happy sparks will come out on top. This entry was posted in (trail) running, society, un nimweegs rondje and tagged Cairo, cairorunners, Egypt, girl power, mudsweattrails.nl, Nijmegen, parkour, political analysis, salomon, Tehran, urban trails, William Pharrell. Bookmark the permalink.